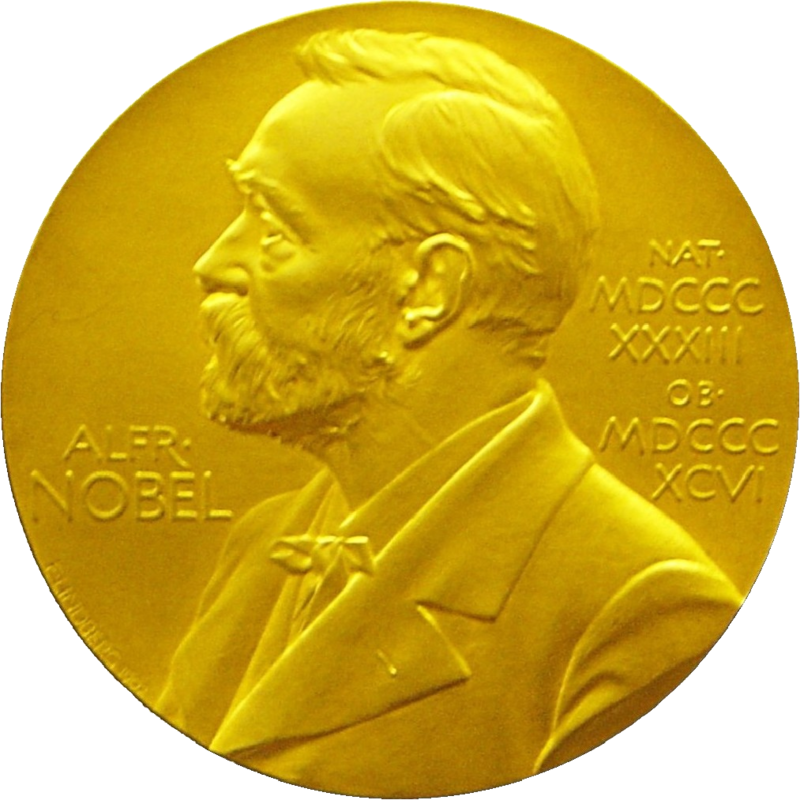 All 11 winners of the 2013 Nobel Prize in Medicine, Physics, Chemistry and Economics have connections with Elsevier, publishing journal articles and book chapters and serving as journal editors, editorial board members or reviewers. 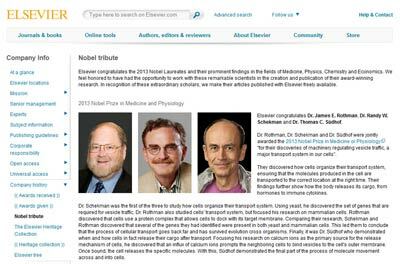 Today, Elsevier launched its 2013 Nobel Tribute website to honor and congratulate these laureates and provide free access to some of the research they published with Elsevier. Dr. James E. Rothman, Dr. Randy W. Schekman and Dr. Thomas C. Südhof were jointly awarded 2013 Nobel Prize in Medicine or Physiology "for their discoveries of machinery regulating vesicle traffic, a major transport system in our cells." They discovered how cells organize their transport system, ensuring that the molecules produced in the cell are transported to the correct location at the right time. Dr. Schekman was the first of the three to study how cells organize their transport system. Using yeast, he discovered the set of genes that are required for vesicle traffic. Dr. Rothman also studied the transport system but focused his research on mammalian cells. Comparing their research, Schekman and Rothman discovered that several of the genes they had identified were present in both yeast and mammalian cells. This led them to conclude that the process of cellular transport goes back far and has survived evolution across organisms. Finally, it was Dr. Südhof who demonstrated when and how cells release their cargo after transport. Focusing his research on calcium ions as the primary source for the release mechanism of cells, he discovered that an influx of calcium ions prompts the neighboring cells to bind vesicles to the cell's outer membrane. Once bound, the cell releases the specific molecules. With this, he demonstrated the final part of the process of molecule movement across and into cells. In 2010, Dr. Südhof talked to The Lancet about music, politics, his favorite book and more. Read the Q&A. With their combined research, they revealed the critical process of the movement of molecules through cells, which can pave the way for targeted medication for a variety of neurological and immunological diseases, such as diabetes, autism and Parkinson's Disease. Dr. Rothman, of Yale University, was the series editor for Methods in Enzymology (1992 edition) and is an Editorial Board Member for FEBS Letters. He has also published in a number of Elsevier journals, including Cell and Current Biology, and was a contributing author to Methods in Enzymology. Dr. Schekman, who heads the Schekman Lab at the University of California, Berkeley, published in the Elsevier journals Cell, Developmental Cell, Cell Biology and Cell Host & Microbe, and was a contributing author to Methods in Enzymology. He has also been awarded the 2013 Otto Warburg Medal by the German Society for Biochemistry and Molecular Biology (GBM) for the discovery of the regulation of protein transport processes in cells. 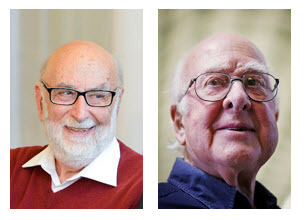 Dr. François Englert and Dr. Peter W. Higgs were jointly awarded the 2013 Nobel Prize in Physics for their "theoretical discovery of a mechanism that contributes to our understanding of the origin of mass of subatomic particles, and which recently was confirmed through the discovery of the predicted fundamental particle, by the ATLAS and CMS team experiments at CERN's Large Hadron Collider". In 1964, Dr. Englert and Dr. Higgs, independently of each other, proposed a same theory of how matter acquires mass. They believed it was through an undiscovered particle, now known as the Higgs Boson, that all matter has mass and thus that all objects exist. In their theory, the particle blankets everything in a field, including empty space, forcing all matter to interact with this field, thus acquiring mass. A half century later, in July 2012, their proposed theory was confirmed at CERN (European Organization for Nuclear Research) in Switzerland. Two research teams, using two high-energy general purpose detectors ATLAS (A Toroidal LHC Apparatus) and CMS (Compact Muon Solenoid), managed to find conclusive evidence that the Higgs Boson particle exists, by extracting it from billions of particle collisions. The discovery of the Higgs Boson particle solves one of the largest inconsistencies in modern physics. Prior to confirming Higgs Boson, the Standard Model of particle physics explained all but one remaining element – how mass is acquired. Following the Standard Model, all should be perceived as massless, which evidently, was not the case. Dr. Higgs is Professor Emeritus at the University of Edinburgh School of Astronomy and Physics. Dr. Englert, a Belgian theoretical physicist affiliated with the Institute for Quantum Studies at Chapman University in California. Their research can be found in Elsevier's Physics Letters B and Nuclear Physics B. Dr.Englert was also a contributing author to Recent Developments in Quantum Field Theory. "Observation of a new boson at a mass of 125 GeV with the CMS experiment at the LHC"
"Observation of a new particle in the search for the Standard Model Higgs boson with the ATLAS detector at the LHC"
Read more about the Higgs Boson discovery in Elsevier Connect. Dr. Martin Karplus, Dr. Michael Levitt and Dr. Arieh Warshel were jointly awarded the 2013 Nobel Prize in Chemistry "for the development of multiscale models for complex chemical systems." They developed new computer models combining quantum and Newtonian physics. Quantum physics allows for the mapping of chemical reactions on a small scale; Newtonian physics allows for mapping of molecules in a resting state on a large scale, without depicting the chemical reactions. The importance of their discovery lies in the combination of using both in one program. It uses quantum physics to display the chemical reactions, obscuring anything else that is not of relevance to reduce the required computing power, and uses Newtonian physics to model the rest of the molecule. This method of modeling has widespread applications in that it can be used to model virtually every chemical reaction, making it a universal method for computerized modeling. Dr. Karplus was born in Vienna and is affiliated with Harvard University and the Université de Strasbourg. 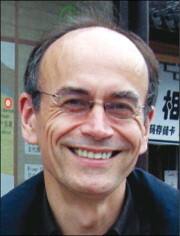 He is Editorial Board member of Structure and has published in a number of other Elsevier journals including Chemical Physics Letters, Structure, Biophysical Chemistry, Biophysical Journal and the Journal of Molecular Biology, and was a contributing author to Advances in Protein Chemistry, Biochemical and Clincial Aspects of Hemoglobin Abnormalities, Methods in Enzymology and Modern Methods for Theoretical Physical Chemistry of Biopolymers. Dr. Levitt, Professor and Chair of Computational Structural Biology at Stanford University, is an Editorial Board Member of Current Opinion in Structural Biology and has published in the Elsevier journals Current Opinion in Structural Biology, Structure and Biophysical Journal. Dr. Eugene F. Fama, Dr. Lars Peter Hansen and Dr. Robert J. Shiller were jointly awarded the 2013 Sveriges Riksbank Prize in Economic Sciences for "their empirical analysis of asset prices." They developed a method of analyzing stock and bond prices over the course of longer periods. Dr. Fama's 1970 paper is associated with the "efficient market hypothesis," which explains why prices fluctuate strongly; new information is incorporated into prices at such speed that no accurate prediction can be made. Dr. Hansen contributed by creating an econometric method that helps to improve the understanding of how a variable (variables are responsible for the price fluctuations) is affected by another variable. Dr. Shiller discovered that stock prices fluctuate much more than corporate dividends, and his work focuses on what determines asset prices, and how to best save and invest. With their combined research, they have created a method to make accurate assumptions about asset prices over time, allowing investors and individuals to make informed decision on how to use their savings. While this is not yet a complete method, the research done by the laureates has revealed a number of important regularities that can be used to develop better methods. Dr. Fama was born in Boston and is affiliated with the University of Chicago. He is an Advisory Editor for the Journal of Financial Economics and has published in a number of Elsevier journals, including the Journal of Financial Economics and the Journal of Monetary Economics. Dr. Hansen was born in Champaign, Illinois, and is also affiliated with the University of Chicago. He is a co-editor of the Handbook of Financial Econometrics: Tools and Techniques and has published in a number of Elsevier journals, including Journal of Economic Theory, Journal of Economic Dynamics and Control, Journal of Econometrics, Review of Economic Dynamics, Journal of Monetary Economics and Economics Letters. He was also a contributing author to the Handbook of Financial Econometrics: Tools and Techniques, Handbook of the Equity Risk Premium, Handbook of Monetary Economics, Handbook of the Economics of Finance, Handbook of Econometrics, Handbook of Macroeconomics, Handbook of Computational Economics and Modelling Stock Market Volatility. Contributing Authors: Jordi van de Weerd (Amsterdam), Inez van Korlaar (Amsterdam) Carolien van der Zanden (Amsterdam), Mary Beth O'Leary (Cambridge, Massachusetts), Michelle McMahon (Waltham, Massachusetts), Marieke Gutschner (Amstedam), Darren Sugrue (Amsterdam), Jess Huband (Oxford) and Gwen van der Heide (Amsterdam).